It was an excellent and well-organized training with a good instructor, Timothy. Thanks, KH! Edmonton, the capital of Alberta is attached to the Canadian province, throbbing with activities concerning government, culture and education. Identifying the need to bridge the gap between skill and knowledge for professionals, KnowledgeHut through its global presence in the e-learning sphere comes as a leading light to aspiring engineers. What is the course all about? Certified Scrum Trainer is an intensive, five-day Scrum Master CSD training in Edmonton, which introduces and familiarises you with core Scrum and Scrum methods through direct instruction and hands-on activities. 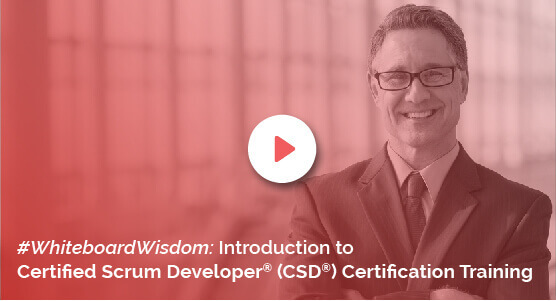 In this five-day course of certified scrum developer certification, you will be introduced to Scrum concepts through a series of exercises employing Scrum methods to build a new application. During the process, you will learn how Scrum works while experiencing the dynamics of delivering in a Scrum team. In view of all these, the CSD certification in Edmontoncomes as a comprehensive training program for software engineers in more ways than one! Benefits of the course: People who register for this course benefit from direct learning and training tailored to each class and student. Live instructions from Certified Scrum Trainers and group exercises focused on agile methods makes the training interesting. Course attendees receive electronic copies of all seminar materials. Attendees can also access the "BackStage Scrum" private forum; a platform of top scrum experts answering the queries of aspirants. The KnowledgeHut way The CSD Course in Edmonton through its agile methodologies and scrum practices offers a strong foundation to these fundamental principles. Making it ideal for all members of a Scrum team or anyone who is interested in working with agile methodologies in a Scrum-based environment, the Certified Scrum Developer training in Edmonton comes as a top choice to pursue and complete. Practical examples demonstrate how to handle changing requirements linked to Scrum, while managing product backlogs, estimates, and acceptance criteria.